The Colombian volcano Nevado del Ruiz is an active stratovolcano with a history of generating deadly volcanic mudflows (lahars) from relatively small-volume eruptions. In 1595, a lahar swept down the valleys of the River Guali and the River Lagunillas, killing 636 people. In 1845, an immense lahar flooded the upper valley of the River Lagunillas, killing over 1000 people. It continued for 70 kilometers downstream before spreading across a plain in the lower valley floor. 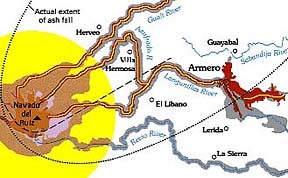 The young village of Armero was built directly on top of the 1845 mudflow deposit. Over the ensuing years, Armero grew into a vibrant town with over 27,000 residents. On November 13, 1985, history repeated itself for the third time in 400 years, with another eruption and another deadly lahar racing down the River Lagunillas. This time, over 23,000 people were killed, including most of the residents of Armero. With proper planning, this tragedy could have been averted. Click volcanic hazards map for more information. 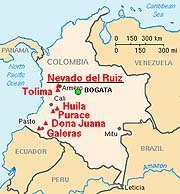 Nevado del Ruiz is the northernmost of several Colombian stratovolcanoes in the Andes Volcanic Chain of western South America. The Andean volcanic belt is generated by the eastward subduction of the Nazca oceanic plate beneath the South American continental plate. Typically, such stratovolcanoes generate explosive Plinian eruptions with associated pyroclastic flows that can melt snow and glaciers near the summit, thus producing devastating lahars. With a summit elevation of 5,389 m (over 17,500 ft), Nevado del Ruiz is the highest of the Colombian volcanoes. Even though it is located only ~500 km from the Earth's equator, its high summit is covered with ~25 square kilometers of snow and ice. Its name, Nevado, means "snow-capped". During the volcanic outbursts of 1595, 1845, and 1985, large volumes of meltwater were derived from melting of the ice pack by hot pyroclastic flows erupting at the summit. Its main crater, Arenas, lies near the northeastern edge of the ice pack. Because all three of these recent eruptions were from the Arenas crater, it is not surprising that the resulting lahars invaded the valleys radiating northeastward from the summit (see volcanic hazards map). After nearly a year of minor earthquakes and steam explosions from Nevado del Ruiz, the volcano exploded violently on November 13, 1985. The initial blast began at 3:06 p.m., and two hours later pumice fragments and ash were showering down on Armero. However, the citizens of Amero remained calm. They were placated by reassuring messages from the mayor over radio, and from a local priest over the church public address system. Nevertheless, the Red Cross ordered an evacuation of the town at 7:00 p.m. However, shortly after the evacuation order the ash stopped falling and the evacuation was called off. At 9:08 p.m., just as calm was being restored, molten rock began to erupt from the summit crater for the first time (all previous eruptions were steam explosions). The violent ejection of this molten rock generated hot pyroclastic flows and airfall tephra that began to melt the summit ice cap. Unfortunately, a storm obscured the summit area so that most citizens were unaware of the pyroclastic eruption. Meltwater quickly mixed with the erupting pyroclastic fragments to generate a series of hot lahars. One lahar flowed down the River Cauca, submerging the village Chinchina and killing 1,927 people. Other lahars followed the paths of the 1595 and 1845 mudflows. Traveling at 50 kilometers per hour, the largest of these burst through an upstream damn on the River Lagunillas and reached Armero two hours after the eruption began. Most of the town was swept away or buried in only a few short minutes, killing three quarters of the townspeople. When rescuers arrived at Armero on November 14, they were greeted by a horrible scene. They found tangled masses of trees, cars, and mutilated bodies scattered throughout an ocean of gray mud. Injured survivors lay moaning in agony while workers tried frantically to save them. Altogether, about 23,000 people and 15,000 animals were killed. Another 4500 people were injured and about 8000 people were made homeless. The estimated cost of the disaster is $1,000,000,000, or about one-fifth of the Colombia's Gross National Product. This is a tragedy that could have been averted. Nevado del Ruiz had served up a steady menu of minor earthquakes and steam eruptions for 51 weeks prior to the November 13 eruption. The on-going activity was just enough to keep people nervous, but not enough to convince authorities that the volcano provided a real threat to the communities surrounding the volcano. Since Colombia had no equipment to monitor the volcano, or geologists skilled in using such equipment, expertise could only come from other countries. A scientific commission and some journalists visited the crater in late February and soon after a report of the volcanic activity first appeared in the newspaper La Patria in early March. By July, seismographs were obtained from several countries to monitor earthquakes which would help in plotting the movement of rising magma beneath the volcano. Money was obtained from the Unified Nations to help map the areas that were thought to be at the greatest risk. The resulting report and volcanic hazards map were finished on October 7, but only ten copies were distributed. Based on the report, the National Bureau of Geology and Mines (INGEOMINAS) declared that a moderate eruption would produce " . . . a 100 percent probability of mudflows . . . with great danger for Armero . . . Ambalema, and the lower part of the River Chinchina." However, some government officials dismissed the report as "too alarming" and authorities did not want to evacuate people until they were assured of the necessity. Continuous earth tremors began beneath the volcano on November 10. This prompted a group of scientists to visit the crater on November 12. However, they saw nothing to suggest eminent danger and they did not recommend an evacuation. The 23,000 people that would die the following day would underscore a tragic failure that led to the second most deadly eruption of the twentieth century.